Fresh air and starry nights abound from the decks of Tall Ship Manitou, one of the largest traditional sailing vessels on the Great Lakes. Come experience one of the best vantage points for experiencing Grand Traverse Bay. 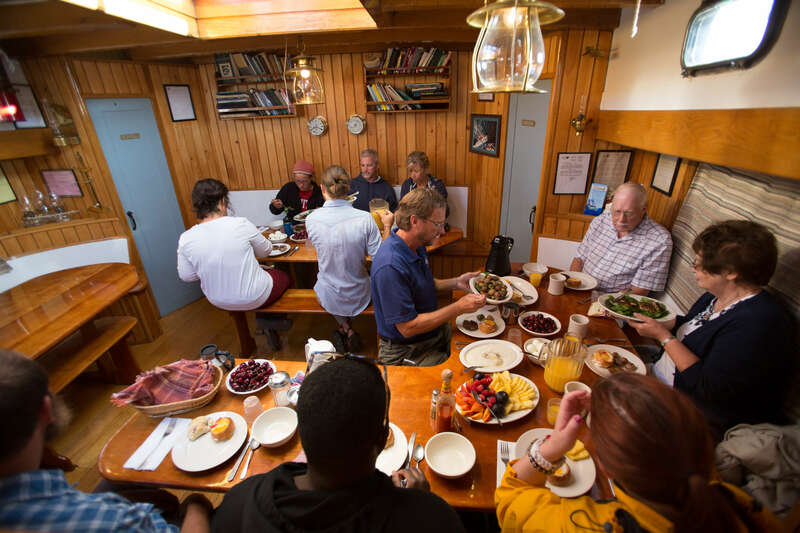 Join us aboard Tall Ship Manitou for the evening sail (picnic meal included), an adventurous overnight secured at our dock, and a hearty homemade full breakfast, cooked on our wood burning stove, in the morning. 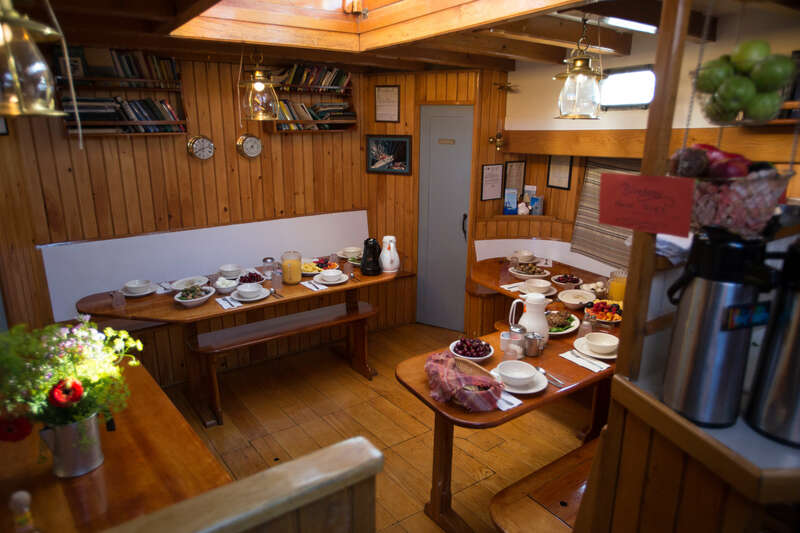 Or, as an added bonus, take a wine tasting cruise, with specially catered Mediterranean fare, on Tuesdays and Thursdays, or an entertainment cruise on Wednesdays. Tall Ship Manitou is a replica of an 1800s "coasting" cargo schooner, similar to those that sailed the Great Lakes and the Atlantic Ocean. Her overall length of 114 feet, beam of 21 feet, and displacement of nearly 100 tons ensures a comfortable, relaxing motion, soothing to both landlubbers and "old salts" alike. We offer a taste of a bygone era, yet are conveniently located near the beach, downtown shopping and entertainment, antiquing, wineries, golf and more. A unique, romantic venue for weddings. 12 cabins. Open seasonally. 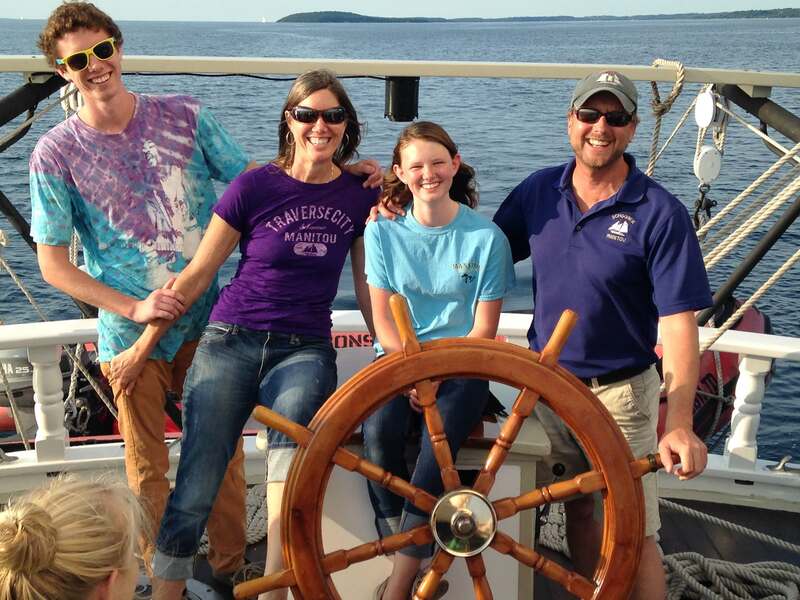 Enjoy a terrific variety of Michigan's best craft beers while sailing aboard Manitou. Our bar features brews from Short's, Brewery Terra Firma, Petoskey Brewing, and Bell's. In addition, we're just minutes away from Right Brain Brewery, The Workshop Brewing Company, Rare Bird, Northpeak and more. accompanied by a light meal of delicious Mediterranean fare catered by local restaurant Silver Swan. Every cruise we offer local wine in our bar and we are right in the heart of northern Michigan wine country, so you have the option of combining a shore side wine tour with a stay aboard Manitou's Floating Bed and Breakfast. Leaving the driving to a professional so you can sip safely. We recommend Traverse City Tours. 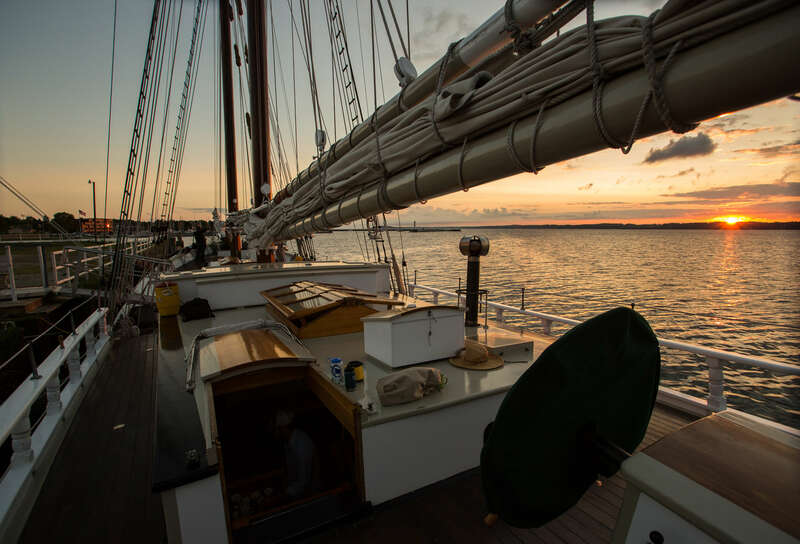 Don't just look at the bay, get out there and experience it from the deck of a tall ship. 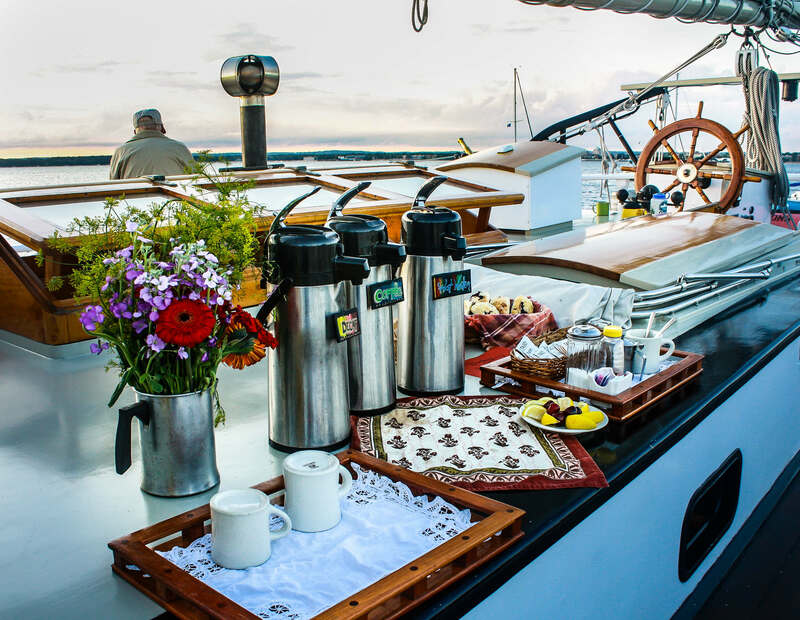 Our Floating Bed and Breakfast Package includes a two-hour evening cruise on beautiful Grand Traverse Bay (picnic meal included), adventurous overnight aboard ship, and full breakfast cooked on our wood burning stove in the morning. Help set sail, take a turn at the wheel or just sit back and relax during your sail aboard Manitou. We are also minutes away from Traverse City's TART Trail (great for biking!) as well as stand-up paddle board and kayak rental facilities, such as The River Outfitters, or Paddle TC. For those who would like to get some beach time in before or after your stay aboard Manitou, we dock right next to Elmwood Park beach and are a five-minute drive from Traverse City's beaches. And of course no one should visit this area without a short side trip to Sleeping Bear Dunes National Lakeshore. With its miles of unspoiled beaches, peaceful hiking trails, and spectacular scenic drives, it's no wonder this park was named Most Beautiful Place in America! 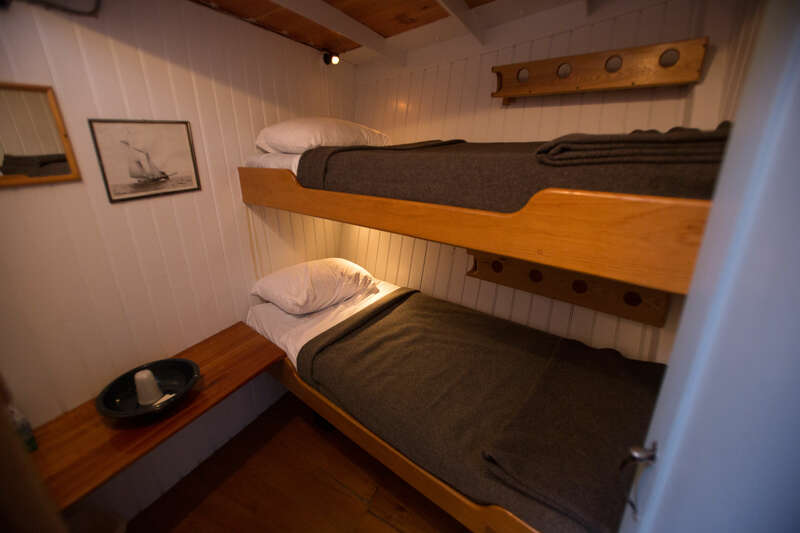 Sail back into history aboard this 114-foot replica of a 19th Century cargo schooner similar to those that plied the coasts and lakes, helping to build this nation. Manitou is just minutes from downtown Traverse City, one of the most vibrant and exciting communities in Michigan, and named on countless top 10 city lists nationwide. 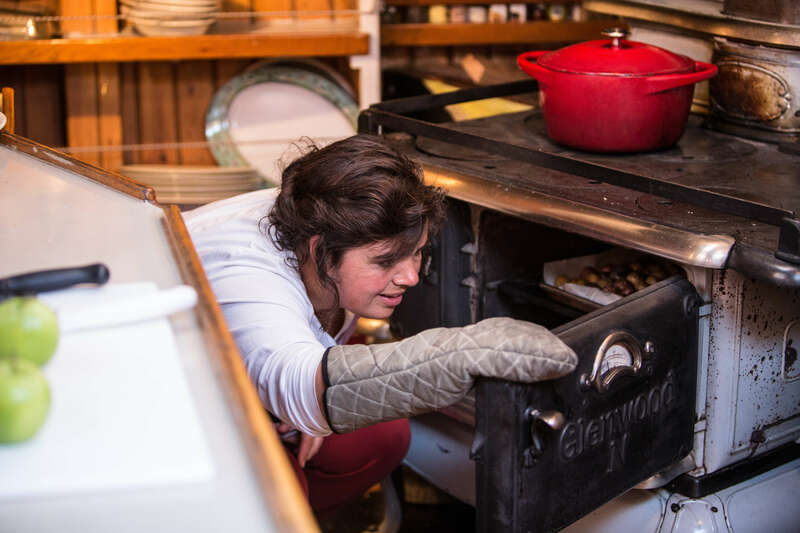 A true foodie destination, the Traverse City areas is bursting with top-notch restaurants, microbreweries, and wineries. And let’s not forget the vibrant art and music scene. The world-class acts performing at Interlochen Arts Academy and the ever-more-popular Traverse City Film Festival are just two highlights of a region brimming with cultural as well as outdoor activities. 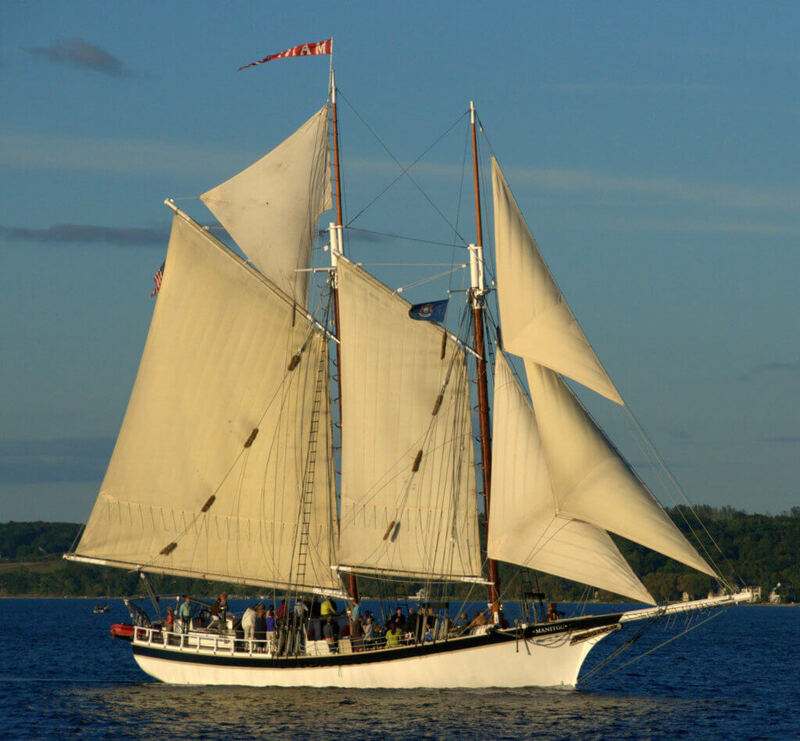 For a unique destination wedding or vows renewal, speak the words aboard Tall Ship Manitou, either on the waters of Grand Traverse or at our dock. Charter Manitou for your special day. Let us customize it for you.